with the view just showing Private Watson's grave. 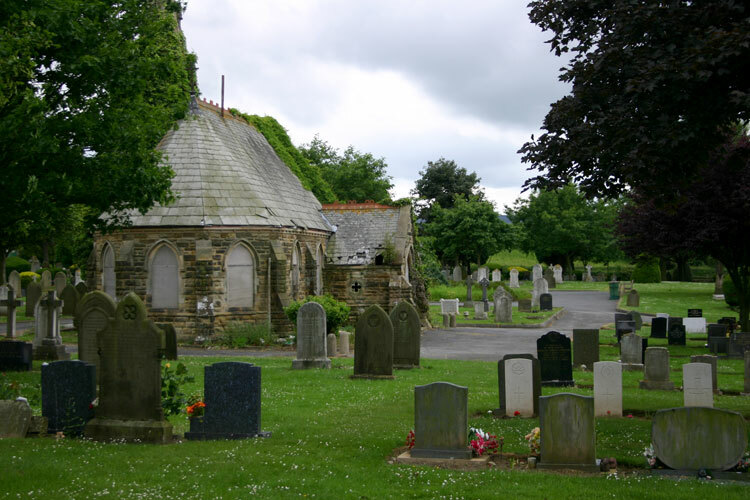 Guisborough Cemetery includes the graves of 8 men of the Yorkshire Regiment who died at home, and one grave of a member of the Green Howards who died at home in World War 2. There is also a family headstone, on which two Smith brothers are commemorated both of whom were killed in the First World War. One of these brothers served in the Yorkshire Regiment. 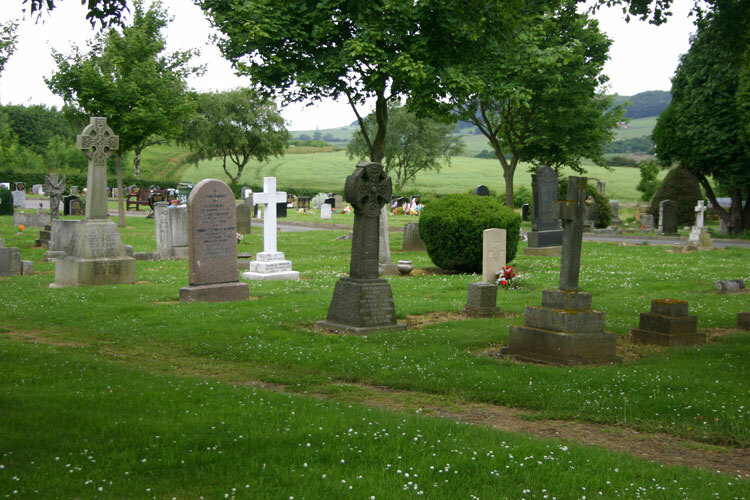 Photos of the headstones are below. 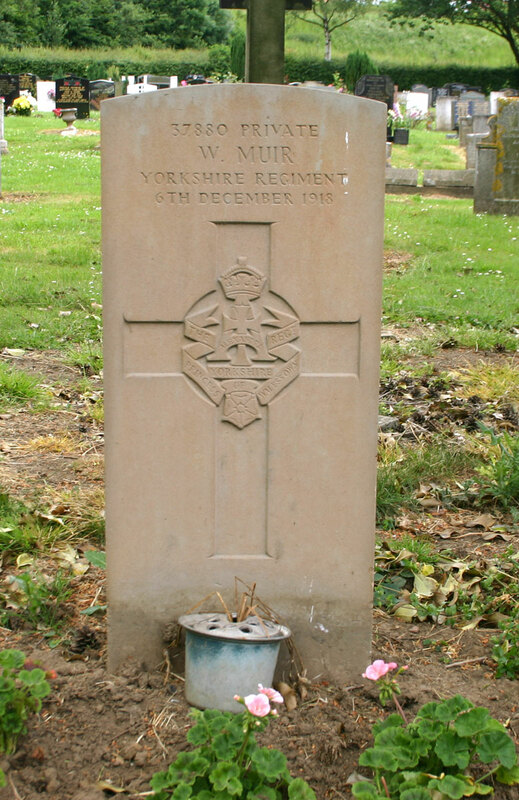 All photos by Edward Nicholl, except for that of the grave of George Hurn which was provided by Colin Appleby (<colinapp@hotmail.com>). 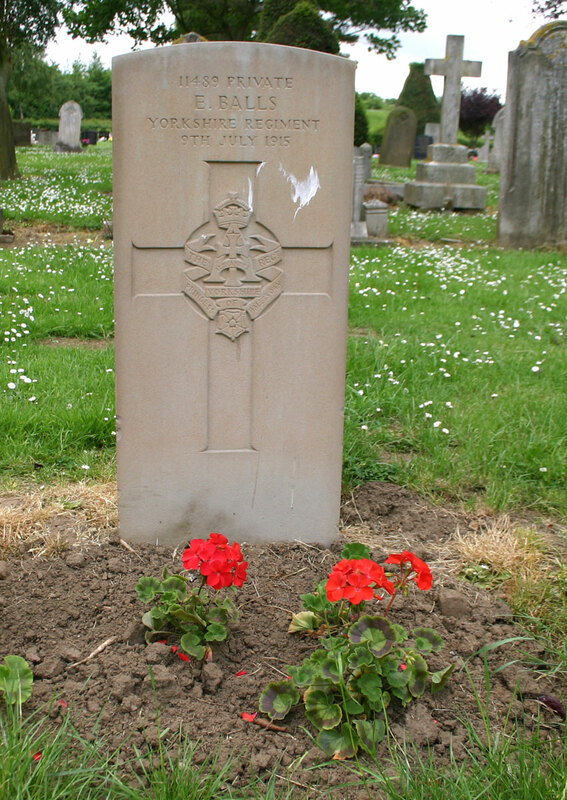 To view a larger photo of each grave, click on the thumbnail image for a larger sized image which opens in a new window..
10th Battalion Yorkshire Regiment. 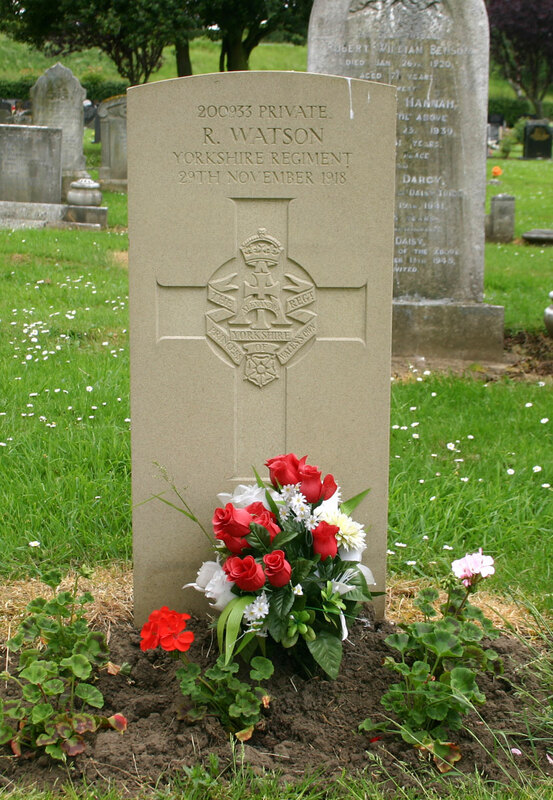 Died 9 July 1915. 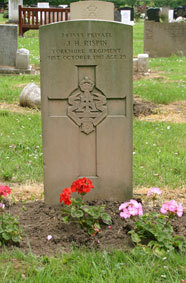 Born Guisborough (Yorks), Enlisted Middlesbrough, Resided Guisborough. 3rd / 4th Battalion Yorkshire Regiment. Died 18 February 1918. 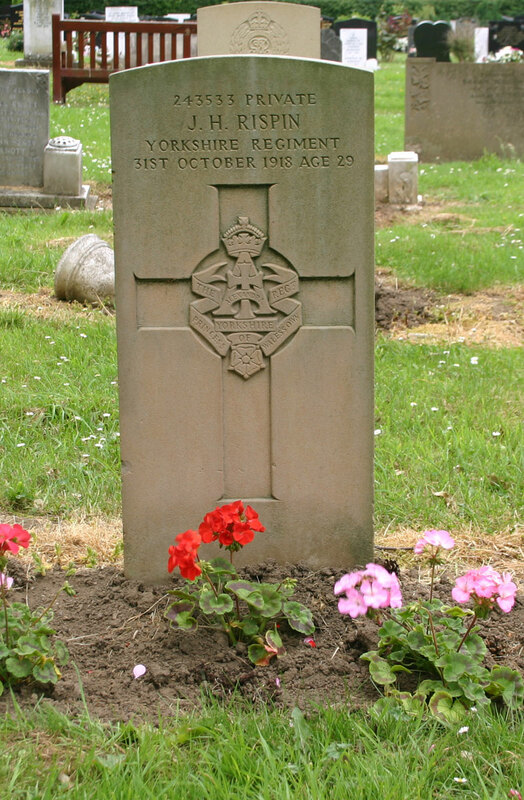 Born Guisborough (Yorks), Enlisted Northallerton, Resided Guisborough. 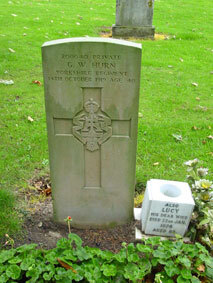 Private George W Hurn. 200040. 4th Battalion Yorkshire Regiment. 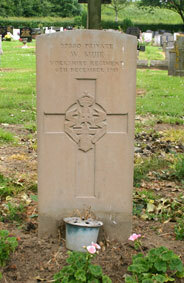 Husband of L. A. Hurn, of 4, Bulmer's Buildings, Guisborough. 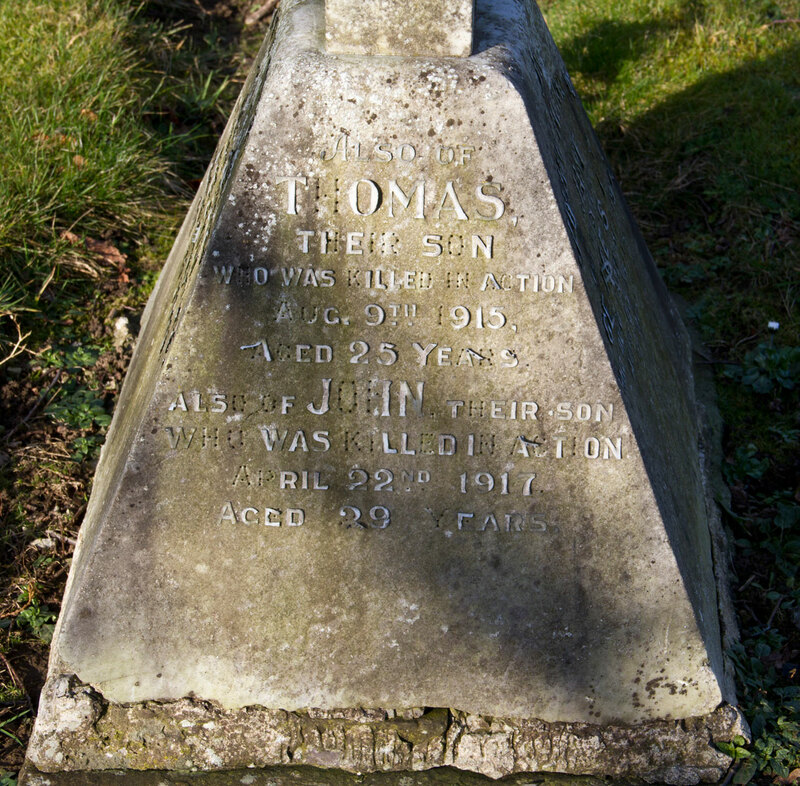 Died 14 October 1919. Aged 40. 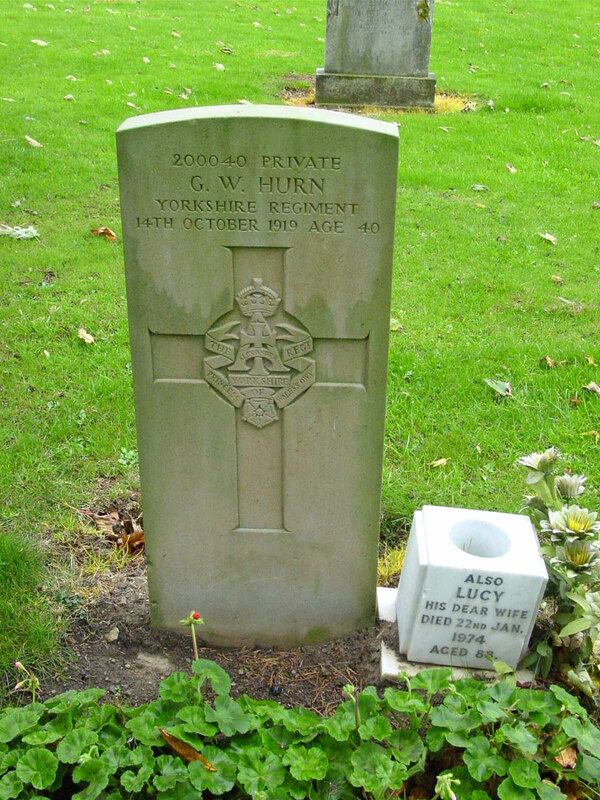 George Hurn's wife, Lucy, is buried beside him. Lucy died on 22 January 1974, aged 88. 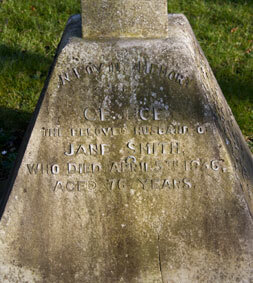 She will thus have been a widow for 54 years, having been widowed at the age of 34. 3rd Reserve Battalion Yorkshire Regiment. 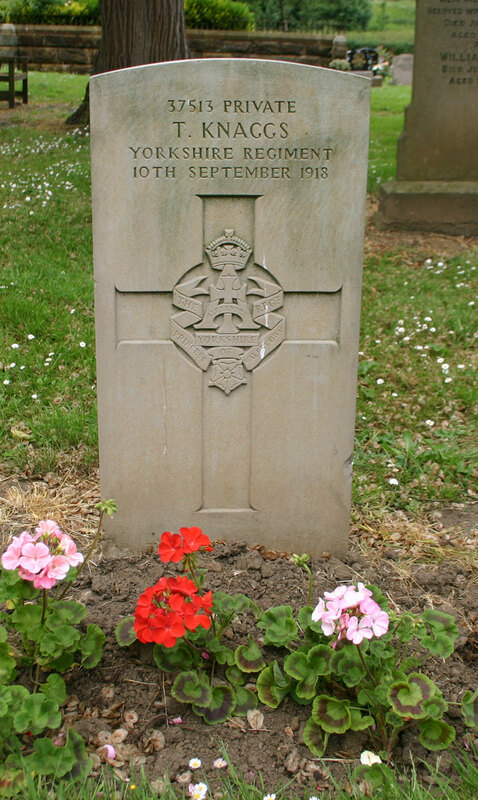 Died 10 September 1918. Born Guisborough (Yorks), Enlisted Richmond, Resided Guisborough. 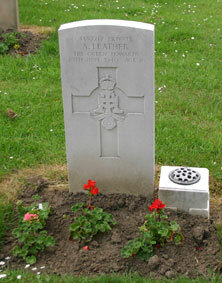 2nd Battalion Green Howards, Son of Suzan Leather, of Guisborough. Died 20 June 1940. Aged 26. 3rd Battalion Yorkshire Regiment. 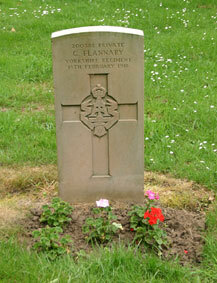 Died 6 December 1918. 2nd Lieut Arthur John Buchannan Richardson. 4th Battalion Yorkshire Regiment. 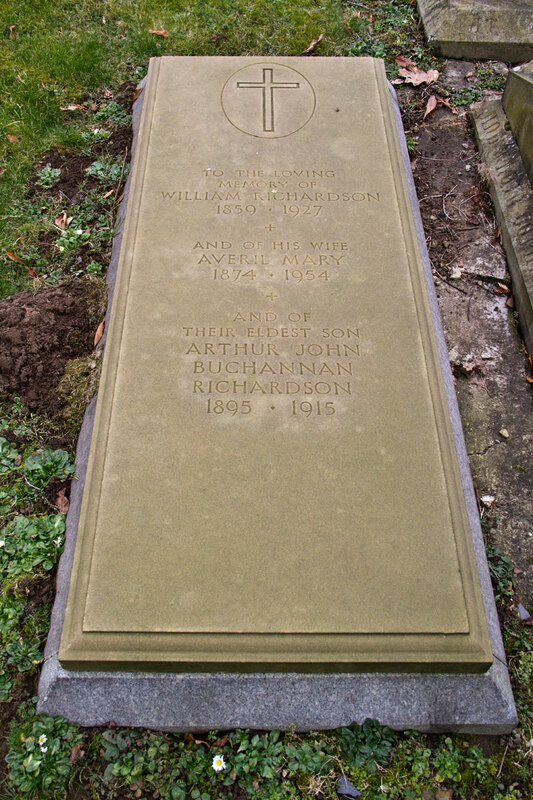 Son of Col. William Richardson, V.D., and Averil M. Richardson, of Daneholm, Sandsend, Whitby. Born at Guisborough. Died 14 January 1915. Aged 19. 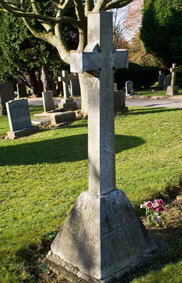 Both parents are also in this grave, - William Richardson d. 1927 and Averil d. 1954. Close to the Richardson Family grave is the headstone for Charlotte (d 16/7/1894) and Charles Richardson (d 26/1/1887) of Ings Farm, Redcar. Private John Henry Rispin. 243533. 3/5th Battalion Yorkshire Regiment. Husband of Selina Tindle (formerly Rispin), of 69, New Cottages, Port Clarence, Middlesbrough. 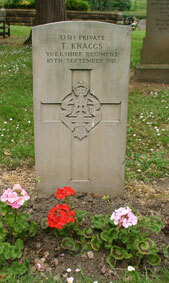 Died 31 October 1918. Aged 29. 4th Battalion Yorkshire Regiment. 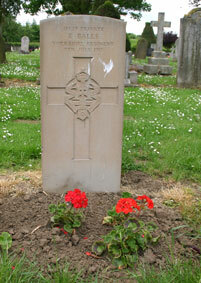 Died 29 November 1918. 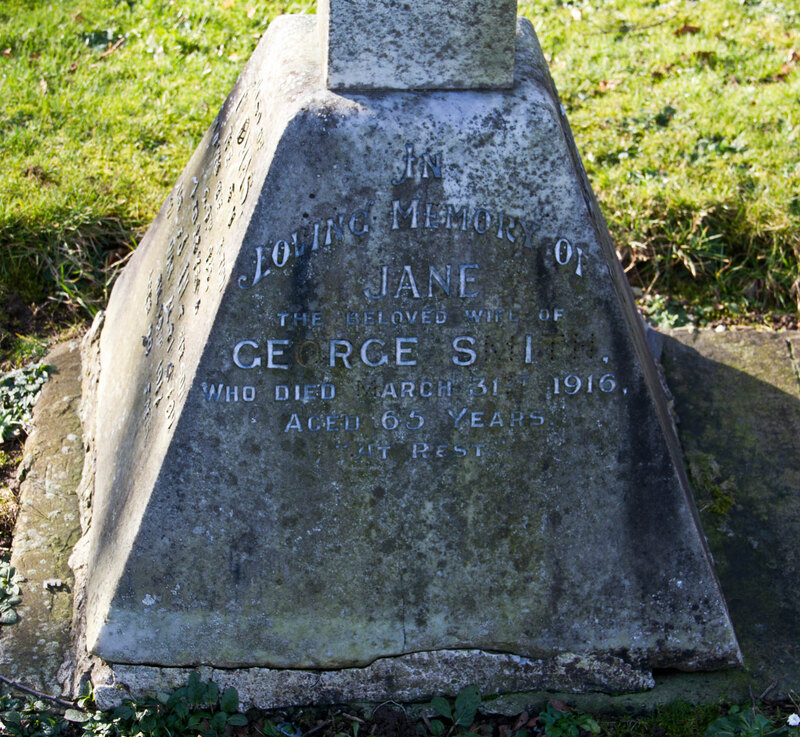 The family headstone for George and Jane Smith in Guisborough Cemetery also commemorates their two sons, John and Thomas, who were killed in the First World War. 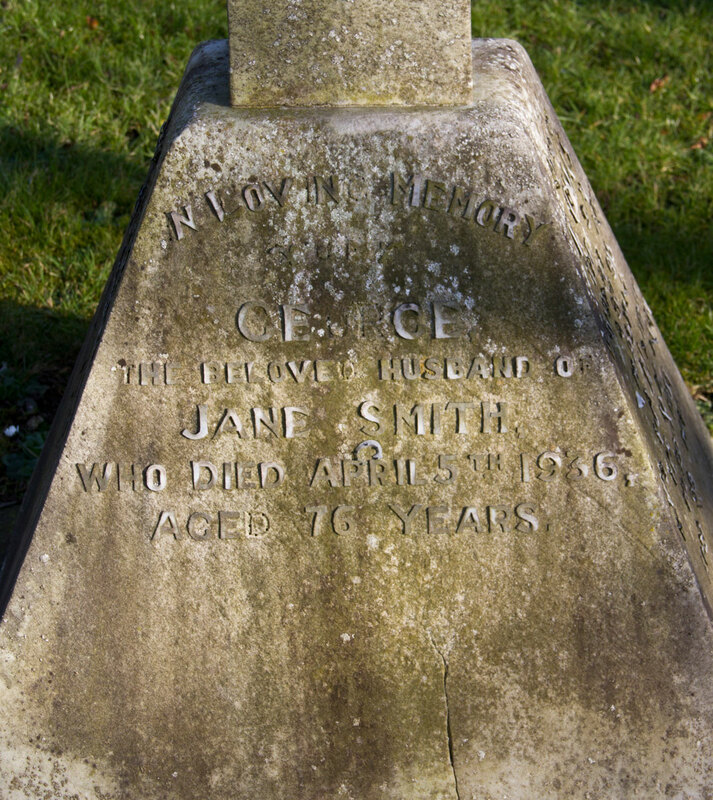 Jane Smith died in the year following the death of her son, Thomas. Private John Elliott Smith, 200318. 4th Battalion the Yorkshire Regiment. 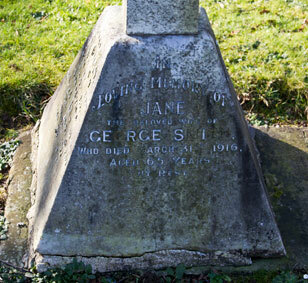 Son of George and Jane Smith, of 78, Belmangate, Guisborough, Yorks. Killed 23 April 1917. Aged 29. 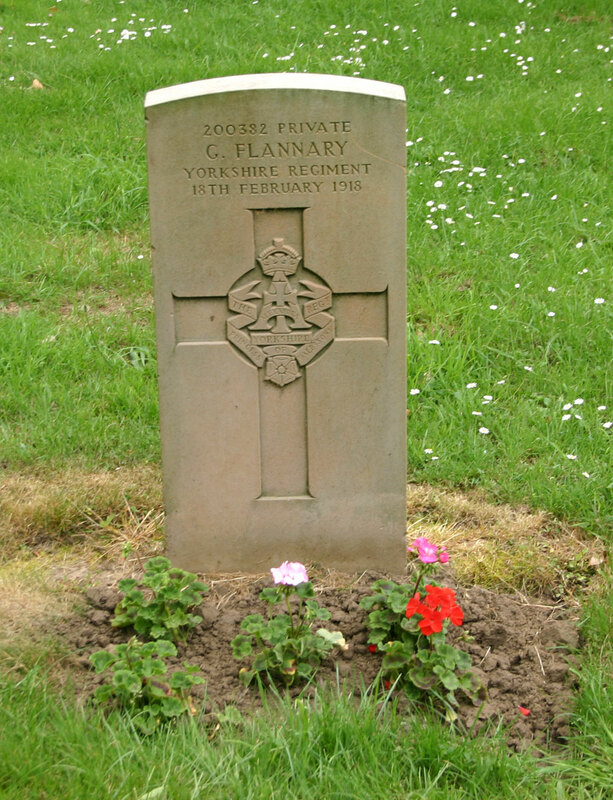 Buried FAUBOURG D'AMIENS CEMETERY, ARRAS. 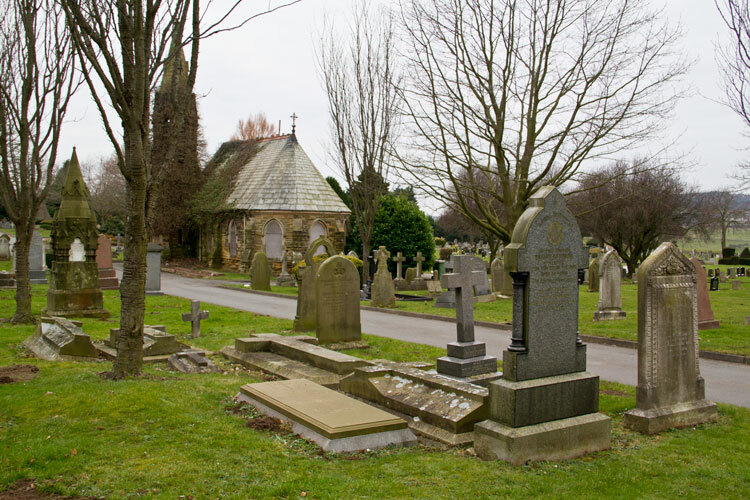 The Richardson Family Grave (foreground) in Guisborough Cemetery.